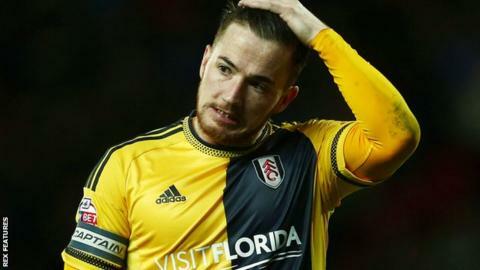 Fulham captain Ross McCormack says the squad's attitude will be crucial in their bid to move away from the Championship relegation zone. The Whites have won just one of their last seven league games and sit 19th, six point above the bottom three. "We are in a dogfight and we need to show some character," the 29-year-old told BBC Radio London. "It is important for the experienced boys in the squad to pull together and give the younger lads guidance." Fulham's campaign has been marred by inconsistency, with the west London side registering back-to-back league wins on just two occasions this season. The Whites are the joint third highest-scorers in the second tier, with 47 goals in 31 games but also have the third-worst defensive record, having conceded 53 times. Moreover, Slavisa Jokanovic's team have not kept a clean sheet in 21 games in all competitions - a run stretching back to the goalless draw with Middlesbrough in October. "We are a team that can't really put two or three similar performances together in a row," Scotland international McCormack added. "If we are to get through this it is time we start doing that." Fulham welcome strugglers Charlton to Craven Cottage on Saturday (15:00 GMT) and, with the Addicks six points adrift of safety, in 23rd place, McCormack has called on his side to play to their potential. "Charlton are below us in the table and we intend to keep them there," he said. "We are at home and we need to take the game to them. If we can reach the levels we know we are capable of it will take care of itself. "We need to show we are good enough to pull away from the relegation zone. "Fitness-wise things are not going to be a problem. It is more mental."